As city council gets set to debate the bike lanes pilot project on Toronto's Bloor Street, there's hope a proposed design, if approved, will reduce one of urban cycling's great pitfalls: getting "doored." As the video above shows, street parking along Bloor Street means cyclists often find themselves pinned between traffic and parked cars. In situations such as these, a driver's door swinging open is especially dangerous. If it happens unexpectedly, a cyclist may face a choice between smashing into the door or swerving directly into the path of a moving vehicle. The proposed plan for Bloor Street includes a design, known as parking protected bike lanes, that would help avoid this scenario. The planned set-up, moving from left to right, is: live traffic — parking lane — 0.6 metre buffer zone — bike lane — curb. "The parking protected bike lane uses the parked car to protect cyclists from live traffic," Jared Kolb, executive director of Cycle Toronto, tells CBC News. 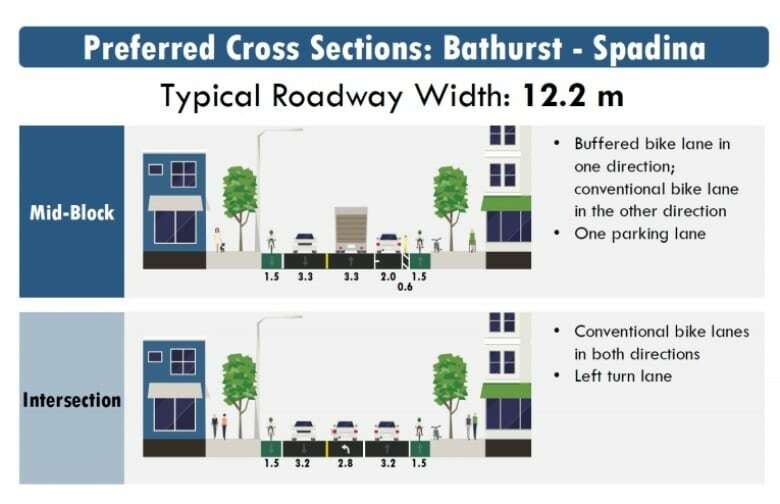 City of Toronto staff are recommending the stretch of Bloor Street featured in the video above be reconfigured with the parking protected bike lane design. Kolb says the design would remove the risk of dooring and encourage more people to use bicycles. City staff are recommending the stretch of Bloor Street featured in the video above be reconfigured with the parking protected bike lane design. A staff recommendation for a pilot project of separated bike lanes along Bloor Street between Shaw Street and Avenue Road will be debated at Monday's public works and infrastructure committee meeting. City council will consider the motion at a meeting next month. If it passes there, the lanes could be installed by late summer.